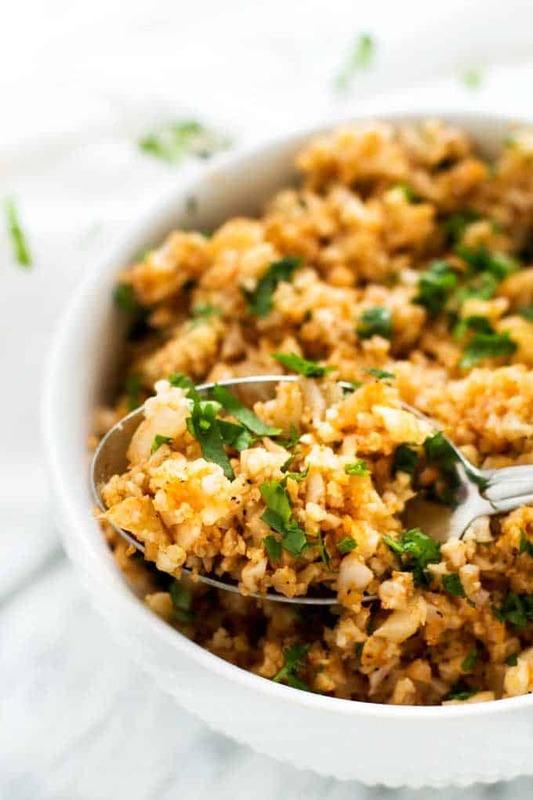 This Spanish Cauliflower Rice is an easy to make side dish you can enjoy without the guilt! 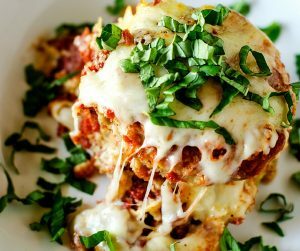 It is gluten-free, low-calorie, low-carb and Keto friendly, making it perfect regardless of what your health goals are. You will be surprised at how much Cauliflower Rice tastes like the real thing. For years it has seemed like a sick twist of fate that I adore carbs, but my body does better when I limit them. Not only do I have more energy, but I find that the more I focus on vegetables, proteins and healthy fats the easier it is for me to lose weight. I’ve known this for years, and I just ignored the fact because it makes me sad. Then I turned 45, and I realized that my “weight creep” had gotten out of hand. I had to do something. I tried going (back) vegan on three occasions last year. It is an easy diet for me to maintain because I love the food. My digestion was a disaster. I was constantly hangry, and my B12 and Iron anemia quickly resurfaced. Obviously, this is frustrating because I have so many friends who do beautifully on a vegan diet. Chalk one up to bio-individuality I suppose. 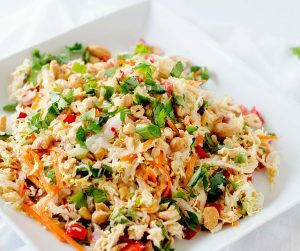 I thought I couldn’t live without things like rice, but it turns out there is an easy substitution. 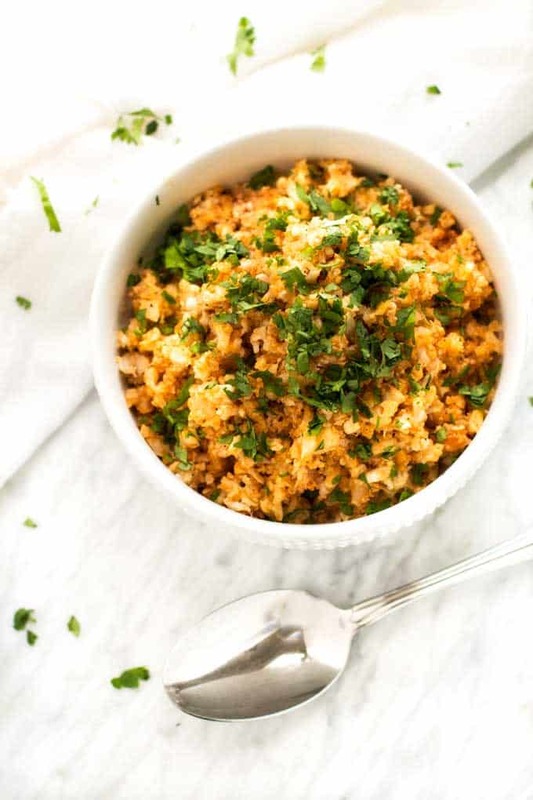 This Spanish Cauliflower Rice is just as delicious as settling down to a big bowl of rice. Really, it is. It is also the best way I’ve found to make Keto rice. Cauliflower has quickly become a rock star in my kitchen, and I couldn’t be happier with my new leading man. 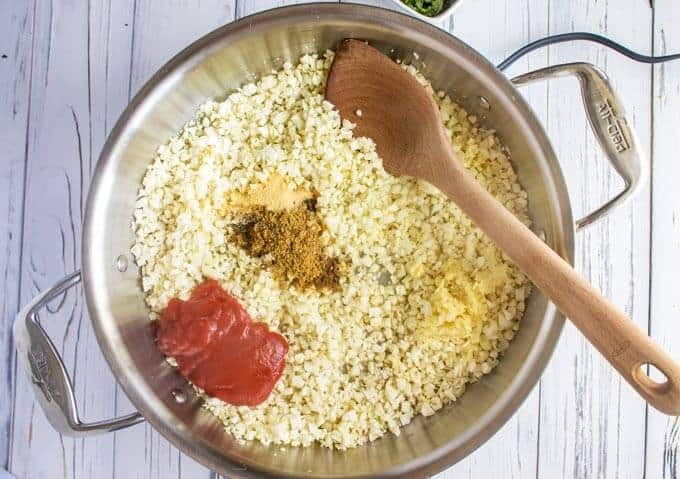 If you are looking to limit carbs, or just lower your calories, this Spanish Cauliflower Rice Recipe is one you are going to want to try! 3 Can You Buy Cauliflower Rice? 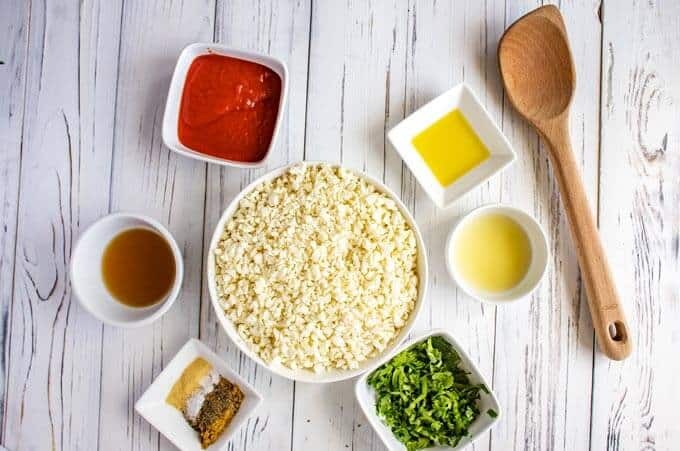 4 How Do You Cook Cauliflower Rice? 5 How Long Can I Keep Cauliflower Rice in the Fridge? Absolutely! Trader Joe’s was one of the first to come out with cauliflower rice that you can buy. Now, there are numerous brands available including Green Giant and Birds Eye. I have even seen several grocery stores with store brand cauliflower rice. Look for cauliflower rice in the freezer section and the produce section. 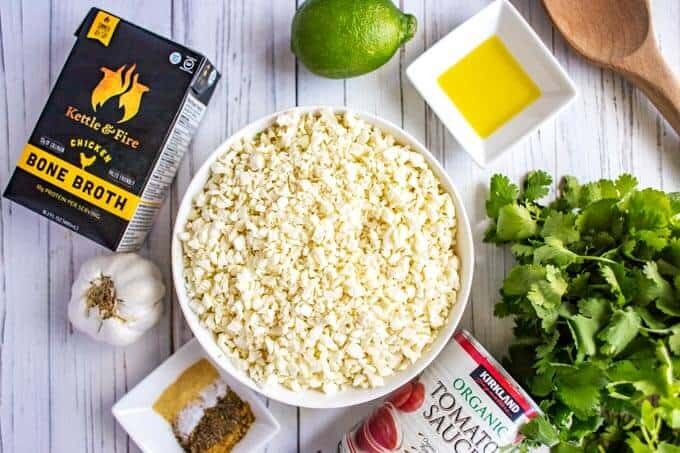 How Do You Cook Cauliflower Rice? The best way to cook cauliflower rice is to saute in a little oil for five minutes. Add liquid to the pan and cover. Cook for another five to ten minutes. How Long Can I Keep Cauliflower Rice in the Fridge? Cauliflower Rice will keep in the fridge for up to five days. 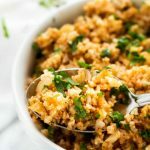 This Cauliflower Spanish Rice Recipe is a delicious low-carb side dish that you can enjoy without guilt! Naturally Gluten Free and Keto Friendly. Cut cauliflower into florets. Place in a food processor and process until “riced”. Heat olive oil over medium heat in a large skillet. Add cauliflower and cook for five minutes. Stir in tomato sauce, broth, garlic, onion powder, cumin, sea salt and black pepper. Cover and cook for 5 to 10 more minutes, until tender. Uncover. Toss with lime juice and garnish with cilantro. Add 1/2 diced onion to the skillet with the cauliflower. Add 1/2 cup thawed frozen baby peas when you add the seasonings. Omit the cilantro and garnish with parsley and parmesan cheese. Use broccoli instead of cauliflower for Broccoli rice. Serve as a side dish for tacos, enchiladas or burritos. Serve with Sheet Pan Chicken Fajitas. Short on time? (Or don't have a food processor.) It is easy to find already riced cauliflower at most grocery stores. You will find it in the produce section or in the frozen section. If you find that your cauliflower rice is sticking to the pan, you can fix this by adding a little more oil or liquid to the pan. This was amazing! Love it! 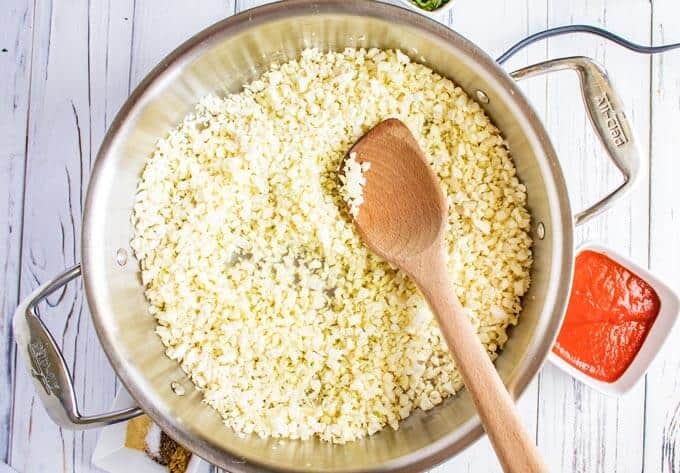 Can frozen cauliflower rice be used instead of fresh and dealing with processor? I’m very new to the Keto/Low Carb diet. I was so sad thinking that I was going to have to give up Mexican food. Then I came across you recipe and was so Happy! I tried your recipe and it was really good except that it was really salty. I don’t add salt to my food when I cook or after…but thank you so much for coming up with this recipe. God Bless. You could always dial it back if pepper isn’t your thing, but I honestly double the pepper when I make it for our family. I like food that has a kick to it. A 1/4 teaspoon of pepper for four servings really isn’t that much at all. I just made this tonight (hubby and I are low carb). I doubled your recipe and used frozen riced cauliflower because I love the convenience. This was DELICIOUS! Thank you so much for sharing it!!!! I am so glad that you enjoyed it! I’ve been using frozen cauliflower quite a bit myself lately! thank Wendy! Previously I did not know that the SPANISH CAULIFLOWER RICE is so great! I made this for dinner tonight and my 4 year old grandson ate 4 helpings. He loved it! Great recipe. You made my day! Nothing better than when you can get little ones eating veggies.